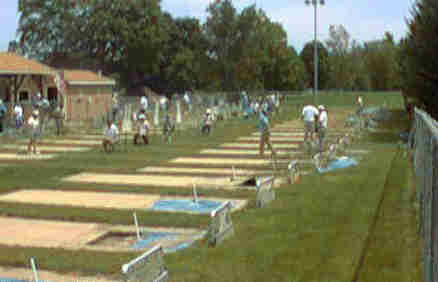 The New England Championships were hosted on these Courts in 1994 and in 1996. 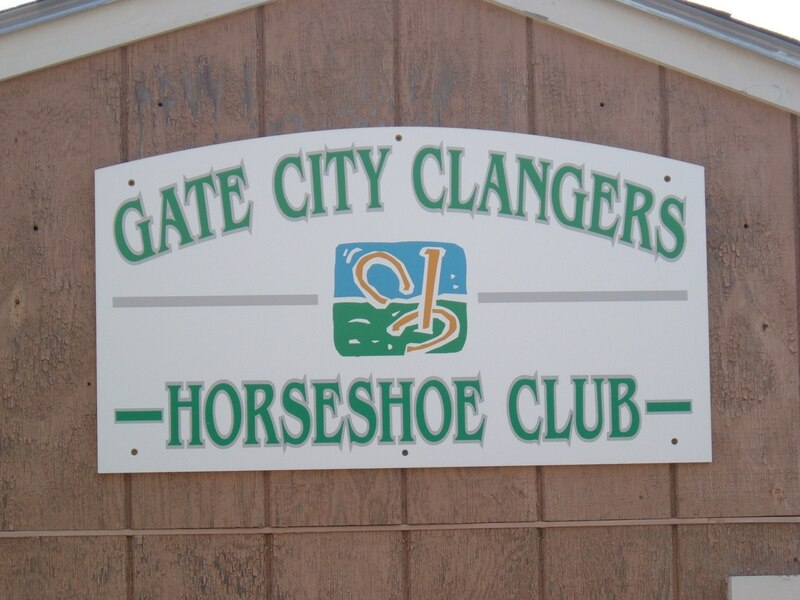 .Gate City Horseshoe Club is a sanctioned League club and is the host of several sanctioned tournaments each year. We pitch 'Walking Singles' on Tuesday nights starting at 6:30 p.m. using a handicap system. Thursday nights are reserved for Tuesday rain outs. We pitch 4 Games, count all scoring, 30 shoes per game. Teams are randomly selected by computer each week. Money prizes are awarded for highest scoring team each week and a player rewarded for best overall performance each week. We also have one tournament mid-season closed to league members only. Trophies are awarded to the top 3 in each class. Greeley Park is a public park and the horseshoe courts are available for public play. There are 24 clay courts available. The league maintains the courts and clubhouse, Parks and Recreation maintains the grounds, water and electricity. The courts are lighted for league play. We host a minimum of 2 sanctioned New England tournaments per season starting with the 'Past Pitchers Memorial' in late May and the 'Nashua End of Year Open' in September. We rotate hosting the 'New Hampshire State' tournament showcasing New Hampshire's finest pitchers with the Keene Horseshoe Club and the Andover Horseshoe Club. Membership fee is $30/season. League play starts early May and runs late into September or early October depending on weather. Each league member must have an NHPA card for the current season. NHPA card is $25/season. League play for the 20112 season starts on Tuesday, May 8, 2012 with signups scheduled for Tuesday, May 1st and Tuesday, May 8th. Club dues and NHPA membership fees due at signup. Club dues and NHPA membership fees due at signup. Map and directions to Gate City Horseshoe Club.